This promotional tie-in will absolutely, definitely, unquestionably get me to not do anything to change that. I don't really care about Fortnite, one way or the other. I do wish I could go a whole two weeks without hearing about it, though. Never played the game & not going to. However, this article's description of how his time was spent playing the game is exactly what I imagined it would be like. -In my very first squad match, I was playing on Switch with a team of guys who clearly knew what they were doing. Unfortunately, I didn't have any way to communicate with them, so when we were flanked from behind by another team, they didn't know until it was too late. From that moment on, I played on my PS4. -A vast majority of my matches were played with children who didn't speak any English. Suffice to say, we didn't get too far in those matches. In one particular match, my squad landed at Tomato Temple and proceeded to absolutely scream at one another in Spanish. We were killed within two minutes of the match starting. -In another match, I could hear a father in the background giving his son advice on play. That kid was the first to die and hearing him yell at his dad brought me so much joy. -Most of my squads picked Tilted Towers as our initial starting point. In a majority of those situations, we were wiped out before we even had a chance to meet up. -When we weren't going to Tilted Towers, choosing a starting position seemed to be a point of contention for my various groups. In one match, three of my teammates picked three wildly different destinations in different corners of the map. The one time I picked a starting point, everybody on my team ignored me and went their separate ways. -In one match, three of us landed near Paradise Palms while the other somehow ended up near Fatal Fields. When he got shot, he started begging us to come to save him, and when we didn't, decided to stay on the com and complain about how we somehow didn't run all the way across the map to revive him. -I had a teammate walk directly into enemy fire because he didn't get the gun he wanted in the first minute of the match. -In one match, a teammate found a golf cart and was never seen again. -I had a teammate construct an elaborate system of traps in a gas station, ignoring our pleas for assistance when we were getting flanked. -There was a child on one of my final teams before writing this piece who refused to go on until everybody said "hi" to him. -No less than 12 of my teammates were gunned down while dancing. All of those experience add up to make for a game I never want to play again, but there is one more moment that absolutely takes the proverbial cake: My team landed at Tilted Towers and within seconds I happened upon a chest with a legendary heavy shotgun inside, which I used to take out an opponent who landed just moments after I did. One of my teammates was killed and because the area was crawling with enemies, none of us could save him. I was alone in this building until one of my teammates appeared and immediately started slashing at me with his sickle pick-ax. Initially, I thought this was a newbie to the game, but as he was adorned in Battle Pass gear, that probably wasn't the case. Through four floors of this building, this teammate would not stop attacking me with his pick-ax. I had no idea what the hell he wanted until finally, he turned on his microphone. "Give me the shotgun," he whined in his 12-year-old voice. "I want that shotgun. You have my shotgun. Give it to me, I want it. I want the shotgun." This continued on for a solid minute until I finally dropped the shotgun and told him to take it. He then proceeded to not pick up the shotgun, go outside the building, and immediately die. I could have gone down to revive him, but I mean, would you? I had never played fortnite until three weeks ago. I never thought I would like it and I heard so much about it. I finally played it and now I am addicted to the game. I have played a bit of fortnight. It's ok. Didn't love it didn't hate it. The last thing I would want to ever do is pay real money for fake team clothes when I don't even own any Bills gear in RL. This is hilarious. It’s what I watch the grandkids do and it’s so much fun to watch... for about 20 minutes. How can you not own a Nathan Peterman jersey El? I own zero Bills gear. I Have never bought any NFL gear. I do have a couple t shirts for other teams that were gifts form relatives that don't even know what team I have watched on and off for 30 years. Also Peterman is terrible and he might be the 2nd worst QB they have started this year. Anderson might be worse. They got the letters wrong. They must mean NCAA, not NFL. Right? No? 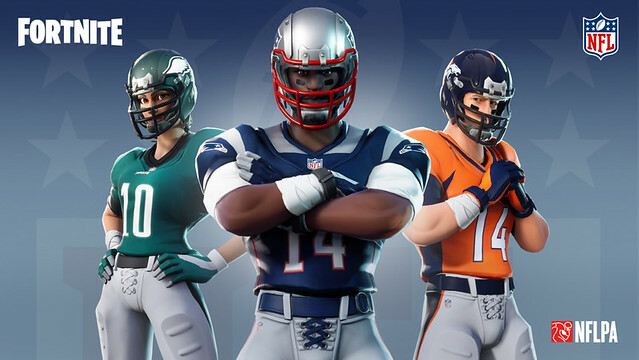 Awesome, for $20 I can buy a football skin. Gee I can't wait to spend my money!